In 2-cup glass measuring cup, mix chicken broth, reserved pineapple juice, soy sauce, vinegar, brown sugar and cornstarch; set aside. In large 12-inch nonstick skillet, heat 1 tablespoon of the oil over medium-high heat until hot. Season pork with salt and pepper. Add to skillet; cook without stirring 2 minutes. Stir occasionally 1 to 3 minutes longer or until browned; transfer to plate, and keep warm. Add remaining 2 tablespoons oil to skillet; stir in broccoli and peppers. Cook 3 to 4 minutes, stirring frequently, until vegetables are crisp-tender. Return pork and juices to skillet. Stir in garlic and gingerroot; cook about 30 seconds or until fragrant. Stir chicken broth mixture, and pour into skillet; heat to simmering. Cook and stir 2 to 3 minutes or until pork is cooked through and sauce is thickened. Stir in reserved pineapple chunks, and garnish with green onions before serving. Serve with cooked rice. If you love the “sour” in sweet-and-sour dishes, double the amount of rice vinegar from 1 tablespoon to 2 tablespoons, and enjoy! 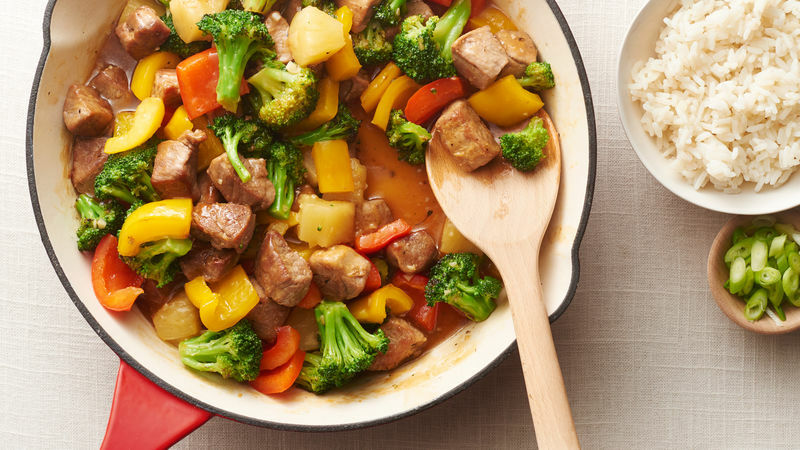 Shelf stable or frozen precooked rice is sold in the grocery store and is great to serve with the sweet-and-sour pork.